Moving stories and reminiscences from students around the world. I first heard Rav Noah speak in Los Angeles in 1982. I was 23 years old and I had never heard an observant Rabbi speak, let alone met one in person. I was a 6th generation Reform Jew from California and my family had been here since the Gold Rush. I had a better knowledge of the non-Jewish Holidays than I had in my own, and every single one of my siblings and cousins had now intermarried. To say I was in danger going in the same direction would be putting it mildly! I had no reason to identify myself as a Jew. I was given a free ticket to a banquet and went with the understanding I was keeping someone company and afterwards we'd go do something interesting! The moment Rabbi Weinberg got up to speak I felt a stir inside me that I had never felt before. I remember his words as if I heard them yesterday. He spoke on how young Jews rejected their religion because they knew nothing about who they were, and if they understood the Torah they would never reject it. I knew he was speaking about me. I felt I owed it to myself and the generations before me to at least find out why we had survived as a people for this long. I gave the organizer my name and number and told him I would be interested in a class when Aish Ha Torah started up in Los Angeles. Several months later I received a invitation to a Shabbat lunch at the young rabbi's house who had been sent from Israel to start up classes here in Los Angeles. I ended up that Saturday at the home of Nachum and Emuna Braverman and that lunch lasted nearly six hours! I had never sat with a rabbi before and I didn't want the day to end! Rabbi Braverman invited me to his class the following evening. I was his first student in Los Angeles! Fast forward 27 years, I cannot believe what a treasure Torah has been in my life. I traveled to Israel many times and had the joy and honor to learn with Rabbi Weinberg. Without his insight and hard work I would be part of a very sad statistic. A couple of years ago I was introduced to a cousin I never knew existed. Our great grandmothers had been sisters. His great grandmother had lived in New York and his family had remained religious. My great grandmother had gone to San Francisco to marry my great-grandfather and had left the traditions behind her. Jyl Klein Riendeau...Children are Tova and Ezra Eliyahu. Tova marries a Shmuel and they had children, Avraham and Chana! Hey -- they are still some Jews here! When he heard how I had reconnected through Aish Ha Torah, he said this family tree is nothing but a miracle. And he's right! Without Rabbi Weinberg my family would not be here today. I owe everything to him and I will try to always live up to the gifts he has given me. About 10 years ago, Rav Noah was having a serious health problem and needed surgery. My 11 year old daughter Tali heard about it and sent him a get well card. Soon after she sent him the card, I received a phone call in my office. The receptionist announced, "Rabbi Weinberg is calling for you." We're all so busy, but somehow Rav Noah made time for the "little big things." I had no idea why the Rosh Yeshiva would be calling me! I picked up the phone. "Marc, it's Rabbi Weinberg. I just wanted to call to say thank you for the beautiful card Tali sent me. Please tell her thank you and I love her." My daughter will never forget the call of the Rosh Yeshiva. We're all so busy, but somehow Rav Noah made time for the "little big things." Dear Reb Noach, You told me the story of how your father, Rav Mattisiyahu zt"l used to say to you when you were a child, "Noach you are taking away my Olam HaBah (my portion in heaven)." You looked at your father and asked him, "How?" He answered, "You are giving me so much pleasure in this world that there won't be any left for me in the World to Come." Reb Noach you have taken away my portion in the World to Come. It's all your fault. Every day when I look into the face of my wonderful children, I have so much pleasure I want to explode. Rebbe, Thank God I have been blessed with a large family. My oldest is 19 and my youngest is two weeks old. I have so much happiness from them. And I owe it all you. Rebbe you saved my family. My father was a Holocaust survivor. A family of Gerrer Chassidim. Hundreds of my extended family were murdered. My grandparents, my uncles and aunts, my cousins -- all gone. After the war, there were only three left. My father came to America connected to his Jewish past but with no strength left. Rebbe you showed me the way. You showed me the wisdom. You showed what was possible. You showed me what it meant to be a Jew again. You gave me the direction to rebuild my history; to rise up after the ashes of Europe and start all over. I shudder to think of where I would be without you. Rebbe you left us less than a week ago. I have not been able to do much. I try to work. I try to help people but I am in a daze. I am amazed at my grief. I have read every article and heard every eulogy. They all are true and they powerful. My parting words want to say one thing: I just want to thank you for the children. For the rest of my life every time l laugh at one of their cute antics or kvell at one of their funny faces, I will thank you. Because without you I would never have had any of this. About 8 years ago, I left Eretz Yisrael with my family for Boston, where we'd accepted a position at the local Aish HaTorah branch. The day before our flight, I sat in Rav Noach's office at the yeshiva and asked him, "Rebbe, what if kiruv (Jewish outreach) isn't for everyone? I mean, each of the tribes had their own path to greatness -- so what if someone said he could write out a tzedaka check -- but he's just not cut out for kiruv?" The Rosh Yeshiva's eyes widened. He looked at me, his voice slowly starting to rise as he said, "Let me ask you something. If they were gassing Jews today, rounding them up in the streets, putting them in concentration camps right now -- would you say, "Listen, saving Jews isn't for me. It's not my thing. I'm just not cut out for it?" I think I had my answer. I saw his passion and was reminded of how I connected with Aish HaTorah to begin with. It was entirely Rav Noach's influence that inspired me to join the U.S. Army as a Jewish chaplain, helping other Jews reconnect with their heritage. I get to Israel just about every year to do concerts, visit my brother and his family and recharge my spiritual batteries. I always try to get into the Rosh Yeshiva's office to say hello and to connect. After all, Rav Noach and Aish are responsible for showing me and my entire extended family the path to Judaism. Our lives are changed irrevocably, filled with such beauty and nachas. On one of my recent trips, the Rosh Yeshiva's secretary said he was in the office but not available, and then suggested a possible meeting time that would be already after my return to L.A. Not ready to be sent away so quickly I lingered outside his door as long as I could and as soon as it opened I exclaimed, "Rosh Yeshiva, how great to see you!" Of course I was immediately welcomed into his office he and asked about my parents and told me about the nachas he gets from my brothers, Rabbi Yom Tov and Aharon. The Rosh Yeshiva asked me to shoot the moon, to go into uncharted waters, to get out of my comfort zone. Rav Noach pondered my options and then said, "I don't think you should do anything like that. I think what you need to do is a CD for the nations...nothing in Hebrew, not for Jews, nothing religious sounding. Instead, write songs that express the values of Torah that we have been spreading for the millennia...those common denominator concepts that continue to change the world. Great music for the world with a beat that they'll like. Keep it cool...don't be too obvious!" Now that the Rosh Yeshiva is gone I realize that I totally disregarded his advice. My last three CDs are the ones described above. They were the "easy" ones to do, with material I had already written, in a market that I know. The Rosh Yeshiva asked me to shoot the moon, to go into uncharted waters, to get out of my comfort zone. I have spent the past 20 years in my comfort zone. Please, God, give me the strength, in the merit of Rav Noach, to face this challenge. I never met anyone who met Rav Noah who didn't come away moved, and with a story. 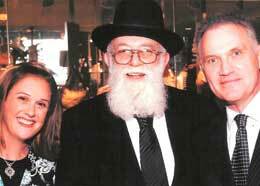 Since the passing of our dear Rabbi, I have witnessed children crying, children who never met Rav Noah but are fully aware of his influence on their families and the world. There is however, one aspect of Rav Noah's vast impact that I believe stands above all else, to which the world will forever know there was a great man who lived here. The Talmud says, that in the next world God will ask the poor people why they didn't learn Torah. They will use their poverty as an excuse, to which the Almighty will show them Hillel; despite his enormous poverty, Hillel became a great Torah scholar. Why does The Almighty need to show them Hillel? Why can't He just say, "I created you, I gave you these obstacles for you to overcome, I know you could have done it." Roger Banister was the first person to run the 4-minute mile. Despite the fact the "common wisdom" in the sports world was that it was impossible, he did it. What is remarkable is that within one year people were running faster than him. Why didn't those other runners do it first? We need to see a Hillel to know we could do it. This is what it means, 'all men are created equal.' Despite the fact that Hillel was a great sage with immense drive, when we see a human being do extraordinary things, we know we can do it too. Despite the fact that Rav Noah was an immense Torah scholar, when he brought assimilated Jews back by the thousands, every single rabbi in the world knew they could do it too. When Rav Noah taught lay people to reach out to their cousins and neighbors, every religious Jew knew they could do it to. Rav Noah moved a mountain when we thought we could only move a few pebbles. Rav Noah changed everything. Every shul became an outreach center. Every city had to have its outreach organization. Everyone understood the only reason non-religious Jews are not learning is because we have not asked them. Rav Noah always liked to tell the Midrash of the faithful servant who was commanded by the king to move a mountain. Every single day he faithfully did his job, bucket by bucket. Then one day, he moved a small rock and the whole mountain gave way. Rav Noah moved a mountain. Rav Noah changed the way we look at a famous saying in the Talmud "All Jews are all responsible for each other. Before Rav Noah we thought of it as a statement. Now we look at it as our mission. Rav Noah made it so that we would never forget our mission, and in this way, he has hastened the day of the Mashiach. Since Shabbos the areas surrounding Melbourne have been under attack from tremendous bushfires. Over 150 people have been killed and thousands of houses destroyed. Entire communities have ceased to exist – wiped off the face of the Earth. Some residents stayed to fight the approaching fires, other people ran. It seems like for many people it didn't make a difference. Fire is the most destructive force in the world, and at the same time it is the most constructive. Without fire we could not have processed, shaped and manipulated the physical world to improve it in the many ways we have. But more importantly, fire is the awesome life-giving power of Aish HaTorah. The magnitude of what Aish HaTorah has done defies belief. The Rosh Yeshiva gave us life and gave us greatness. The Rosh Yeshiva believed in us, unconditionally. What more could a person ask for? The Rosh Yeshiva also gave us understanding and perspective, how to make sense of the craziness in the world around us. Aish HaTorah is the accumulation of all of us, together with the Rosh Yeshiva. And look at how much has been accomplished! The Rosh Yeshiva has the merit of all his hard work, his dreaming and his planning, and he also has the merit of building us. Several years ago I was with a group of Aish Rabbis and the Rosh Yeshiva. The Rosh Yeshiva was chewing us out that we needed to do more. He looked us all straight in the eyes and he said "Do you know what that problem is? I am the problem," the Rosh Yeshiva answered. He continued, "As long as I am here, you guys will never grow up. It is too easy to say ‘the Rosh Yeshiva will take care of it.'" Then he smiled at us and said, "But when I'm gone, you'll have no choice but to take responsibility." As individuals we may not fill the Rosh Yeshiva's enormous shoes, but then the Rosh Yeshiva always said that people who are serious about a cause should create an organization. If the Rosh Yeshiva saw such greatness in each of us as individuals, imagine what we could accomplish if we all worked together. I can only imagine the intensity of the mourning in Jerusalem that many people must be suffering. The Rosh Yeshiva was a father and a zaide to so many people. My heart goes out to the Rosh Yeshiva's family and to all his students who truly appreciate what the world has lost. May Hashem comfort all of us amongst the mourners of Israel. Who was Rabbi Noach Weinberg? "The Rosh Yeshiva was a father and a zaide to so many people" . He is your spiritual father and my spiritual zaide. Thank you to the Rosh Yeshivah for impacting so many generations, even those that never met you. I personally thank each one of you!! I personally thank each and every one of you for writing your reflections on how much you gained from Rav Noach. Yes, since the Rosh Hayeshiva's passing he has been on my mind and heart each and every day. I personally learned a real lot from him. I keep gaining from what he told me and what I heard him say. Reading your personal accounts keeps adding to what I am in the process of gaining. Thank you. Thank you. I am extremely grateful! !